You now have the ability to provide product feature requests and changes relating to Windows Server that go direct to the Product Group. Not only that, but you can build a base of voter support to drive your suggestions across the line. I really like this concept as it removes the difficulties associated with getting your voice heard by those that really matter. Posted by admin on May 20, 2015 at 7:51 am under Active Directory, Windows Server 2012 R2. Had a weird one earlier today. I installed the Windows Server Backup feature on two Windows Server 2012 R2 servers in the same VMware farm. 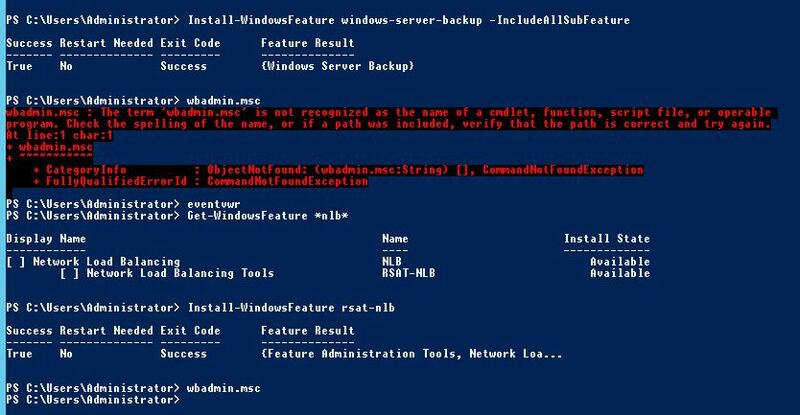 On one server I could start the wbadmin.msc snap-in immediately, but on the other I couldn’t find it at all. I couldn’t find anything in the event logs to explain why it would be missing on that one server. The problem wasn’t resolved by either a reboot or by uninstalling and re-installing the feature. A quick search on Google revealed that some people had resolved the issue by installing the Windows NLB feature. This somewhat bizarre workaround also did the trick for me – although I found I only needed to the RSAT tools for NLB rather than the whole feature. Here’s the proof! These are the days when you don’t try to explain things – just shrug and move on! Posted by admin on November 25, 2014 at 3:08 pm under Windows Server 2012 R2.